Over the past few weeks, I've been trying to collate and order a whole swathe of ephemera in amongst the packing and moving. 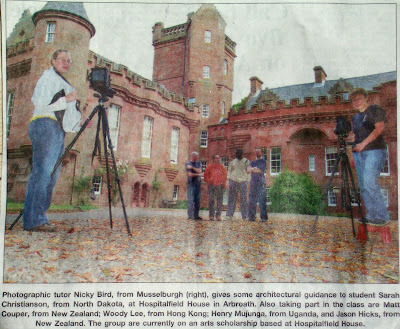 I found this article in my files and I believe, was the only reportage on my residency at Hospitalfield House in Arbroath, Scotland in 2003. It goes to prove that newspaper reportage cliches are endemic the world over. I still keep in touch with Sarah Christianson, now living in California and exhibiting her photographs widely; I recently heard from Nicky Bird, that she was going to be NZ and Australia researching photographic archives. Unfortunately, I've lost contact with Henry, Jason and Woody. At some point, in the not-to-distant future, I'm hoping to return to Arbroath and refamiliarise myself with Hospitalfield House (and its great director, Willie Payne) and the surrounds of Arbroath village.